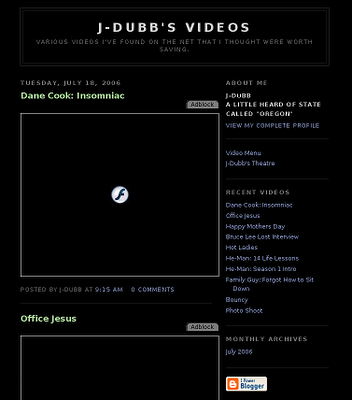 You might have noticed the link on the side of my blog that says J-Dubb's videos. I've started a video blog now for various video codes from You Tube and Metacafe and other such video sites. Origionally, I just wanted a place to put the video codes for videos that I wanted to keep but couldn't download, so I started a blogger-blog for them and made a shortcut on my desktop to give it the feel of having the control over a downloaded video. 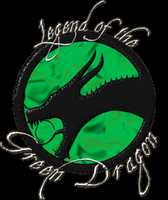 But then I decided to link the page to my main blog as a sort of, mini You Tube, and make it a part of the entertainment of the J-Dubb experience. I've included a Video Menu link which takes you to a blog post that contains a menu of links to all the video posts on the site for easy access. The main page of the blog contains one days worth of posts. 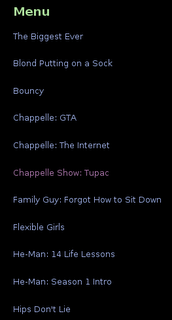 Videos are archived by month and the nine most recent videos are displayed in the sidebar.